Looking for a new spin on homemade pizza? Or a fun twist on Buffalo wings? 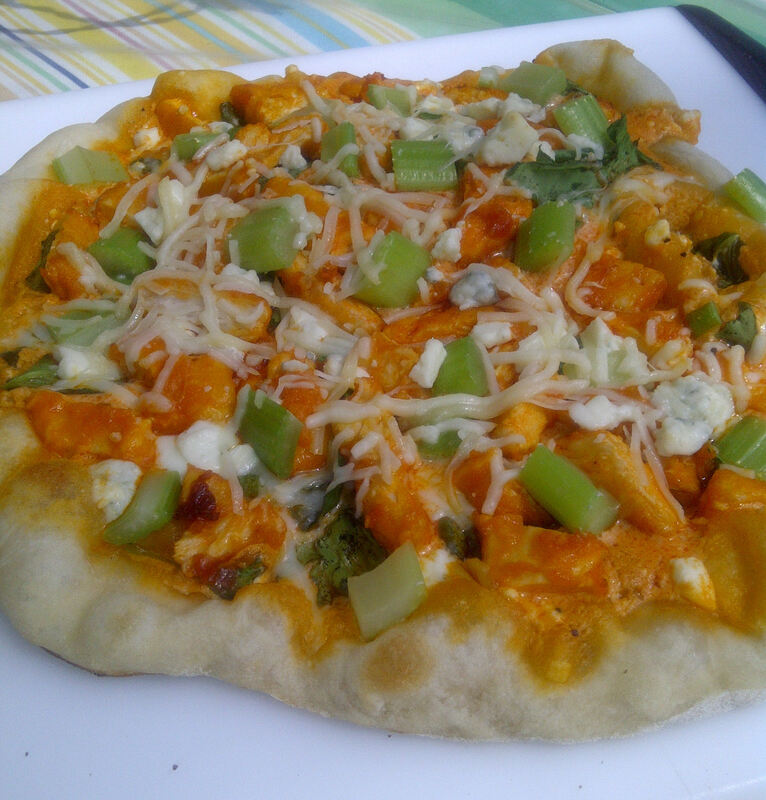 Try this Buffalo chicken pizza. If you love Buffalo wings — or my version with chicken tenders — you will love this, too. You can make your own pizza dough, buy pre-made dough and roll it out, or use a premade pizza crust like Boboli. The measurements listed below are approximate: use as much or as little of each ingredient as you like, in whatever combination that looks — and tastes — best on your pizza. If using fresh dough: Place a baking stone on an oven rack in middle position, and preheat oven to 450 F. Roll out the dough and then place it on a pizza peel coated with flour or corn meal. If using premade pizza crusts: Place oven rack in middle position and preheat oven to the temperature recommended on the package. Place the premade crust onto a pizza peel or large cutting board. Step 1: Make a batch (or a half batch) of my Buffalo chicken tenders, reserving about ½ C of the red sauce and ½ C of the bleu cheese sauce. Step 2: Stir the red sauce and bleu cheese sauce together and spread onto an even layer on the pizza crust, leaving about ½” of the outside edge free of sauce. Cover it, but don’t get it too wet. 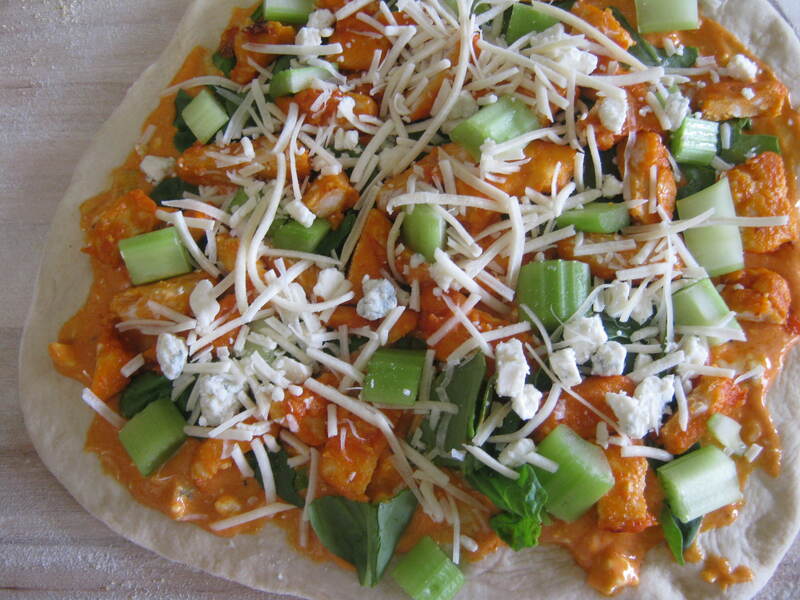 Step 3: Cut the Buffalo chicken tenders into ½” pieces and sprinkle evenly over the crust. Step 4: Sprinkle the diced celery, chopped spinach, and crumbled bleu cheese evenly over the crust. Step 5: Top the pizza lightly with the mozzarella/parmesan and then the cheddar cheese. If using fresh dough: Carefully slide the pizza from the peel onto the baking stone. Bake for 5-10 minutes, or until the cheese is melted and the crust is lightly browned. If using premade pizza crusts: Place the pizza onto the middle rack. Bake as long as the package recommends, or until the cheese is melted and the edges are lightly browned. Remove cooked pizza from oven and place on a cutting board. Allow to cool for a few minutes, then cut into slices and enjoy!